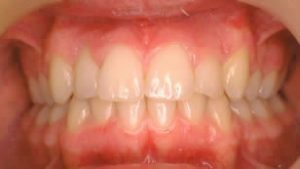 Malocclusion is a common condition where the teeth fail to develop in an ideal position resulting in an unattractive smile and, occasionally, difficulty in eating. Orthodontic treatment to correct a malocclusion involves the movement of teeth using braces. 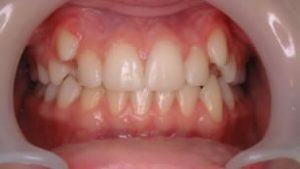 Repositioning the teeth with braces will naturally improve the appearance of the teeth and the way in which they bite together. Patients with severe malocclusion will also find that orthodontic treatment will improve their facial appearance providing a good facial balance and an attractive smile. It is common for appliances to be worn for up to two years. Regular appointments are needed throughout treatment to adjust appliances and monitor progress. If the teeth are badly positioned or crowded then it may also be necessary to have teeth removed by your dentist to provide space to align the teeth into an ideal arrangement. Once treatment is complete, retainer appliances are needed to maintain the correction achieved. What type of brace do I need? There are several types of brace or appliance that can be used during treatment. These appliances may be removable or fixed to the teeth. We now have an exciting range of ‘invisible’ brace systems available at the practice including tooth-coloured ceramic fixed braces, the latest brace system from Invisalign and the high-tech Incognito and Win lingual systems (fitted behind the teeth). See our Private Treatments page for further information. How do I get more information about orthodontists? helping patients with complaints about a dentist or dental care professional and working to strengthen patient protection. There’s a reason why this place has been voted ‘best orthodontic practice’ in the uk…amazing.